The Wicker Picnic Basket is our most popular advanced kit design! Featuring all round reed construction incorporating a 12x14 D handle, this basket is truly a picnic basket to hand down through the family. As shown, the base and lids are split spoke design with half-crosses, a reliable technique for strength and durability. 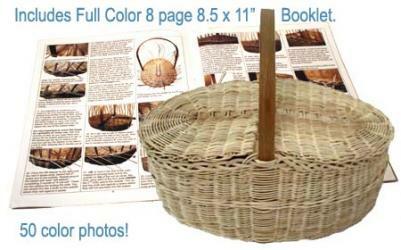 You can even weave a version of this without the lids, if you prefer an open basket for some purposes. You're going to love weaving it as much as we enjoyed designing it! 51 full color illustrations and photos demonstrate every step of the way. 8 pages (8.5 x 11") of instruction. 12x21", 8" deep, 14" tall including handle. SKILLS LEARNED: oval split spoke base with half-crosses, twining, 4 rod coil, rapid braid border and using D handles.